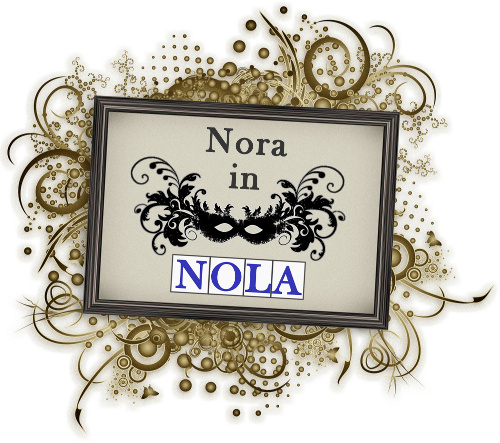 Just had a lovely midweek meal at Ancora on Freret Street. 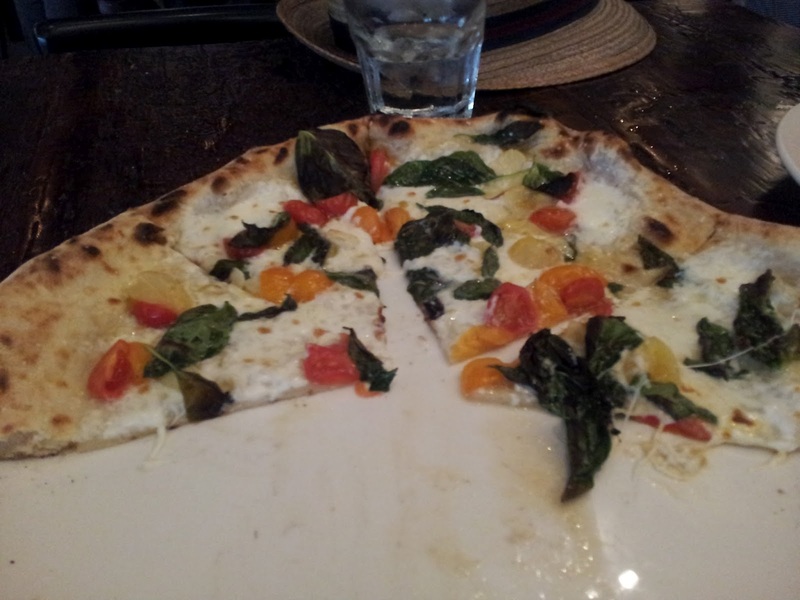 We've been to Ancora a couple of times, so we knew the food was good, but the food, the atmosphere, and the service were just so seamlessly great, I felt it deserved mention. It's basically just photos of yumminess and me saying, "yum," but when you get right down to it, that's pretty much food blogging in a nutshell unless you're bitching about something. So, I was starving when we got there so we ordered their arancini, 2 pizzas, and some adult beverages. I had an awesome cocktail with gin, ginger beer, something that made it pink, and lemongrass. Tom had a Bear Republic Rocket Red Ale. 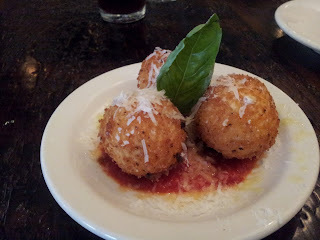 The arancini came- basically fried risotto balls with a delicious mozzarella cheese center. Hard to go wrong. Right? As delicious as advertised. The chef recognized us from when we came in a month or so ago and gave huge props to his sandwiches. He said he was working on an appetizer, did we want to try it? WHY YES INDEED. He came back a few minutes later with a version of bruschetta that wasn't on the menu, and said that he thought we'd like it because we like his bread. Which we very much do. We also liked the big melty hunk of fontina cheese right next to it that needed to be scooped up and applied to the bread with spoons. SPOONS! No picture, but just imagine 3 toasted pieces of fresh bread drizzled with olive oil served with beautiful melty cheese and kalamata olives. Mmm. Then, feeling significantly less famished than when ordering, the first pizza came. I can't remember what it was called, but it had cherry tomatoes, cheese, garlic, and basil, and it was goddamn delicious. 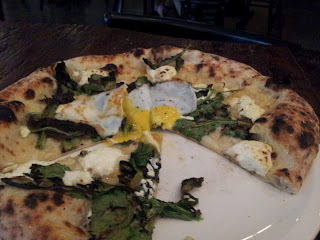 Crust (for both pizzas) was just plain perfect. OK, so that was hella awesome too, and at this point, the intense flavors (as well as the yummy carbs) have sated us quite nicely, even having eaten only half of the pizza we ordered. But then. But then! 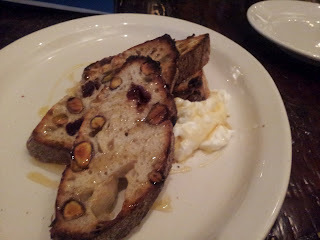 The waiter described the dessert, which was a cherry and pistachio pane agrodolce, baked in house (oh, how I love their bread!) served with marscapone cheese and honey. Raspberry honey, I believe (was cultivated by bees pollinating raspberry plants, not, like, raspberry flavored honey.) Tom pretty much fell out of his chair in wonder when out server described it, and then was rapturous while eating it. It was really just so, so, so, so, so good. When our waiter brought our check, he said that we did a very good job of ordering, which pleased me immensely for some reason. I agree with him. The food we ate was simple, fresh, and delicious- the ingredients were gorgeous and the technique in preparing them was skilled. I mean, it's the kind of simple but wonderful meal that had us saying to each other in wondrous disbelief as we left, "what just happened?" Man oh man, how lucky we are. Ancora also just got well reviewed in Gambit, and I'm psyched for them! Need to get back for lunch soon, though- need my sandwich fix.